A large, visible poster: Design your poster to include a message directly from your department or admin office, encouraging students to take advantage of MWA. View our sample pdf poster and design your own version using our MS Word template. More MWA images are available on our Media Page. Alternatively, you can use the small poster already customized for your school (view). Display technology: Showcasing MWA live on the internet makes a big impact. Set up a computer with a large screen, (or a large plasma TV screen on a stand would be fantastic) and give students the chance to see the MWA site in action. 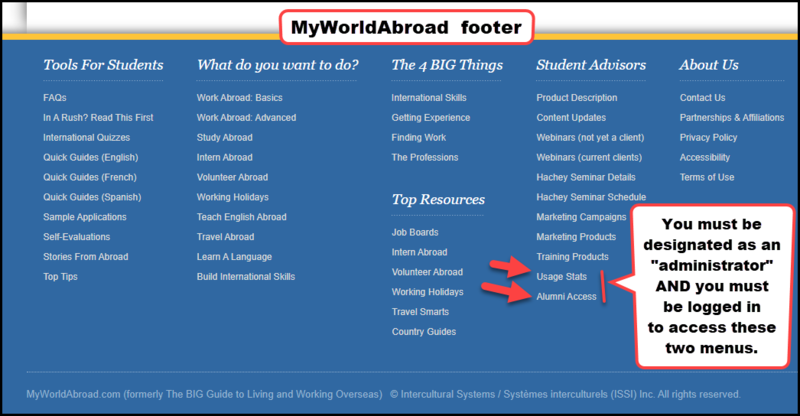 Show students how to register for MyWorldAbroad using the e-mail registration system by going to www(dot)myworldabroad.com/[your-school's-domain-name]. Hand students MWA promo cards and Quick Guides to help them keep it in mind (view). Show students the site’s two most important menus, "What do you want to do?" for those who want to quickly access the essential info, and "The 4 BIG Things", which allows them to access the comprehensive collection of all MWA content. 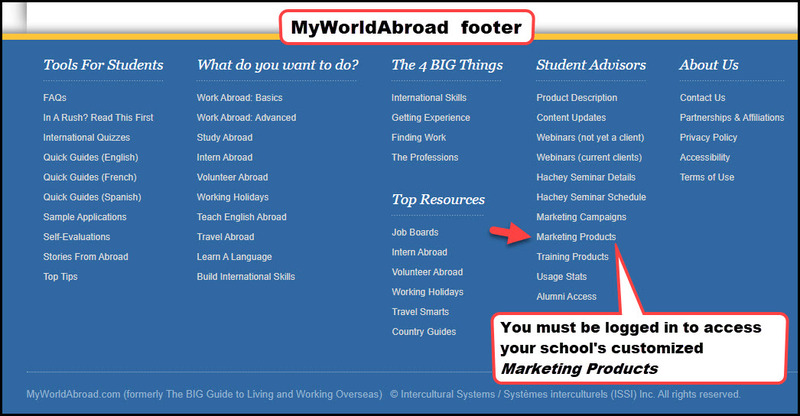 Distribute MyWorldAbroad promo cards at the booth: (view) Have one of your student interns or ambassadors actively hand out promo cards to fair attendees, at the booth and at the fair entrance. Use your fair's site and poster to cross-promote MyWorldAbroad: Consider adding a sentence like this to the fair site or poster: “The Career and Study Abroad offices encourage students to access MyWorldAbroad for expert go abroad career advice and resources.” Add a link to your school’s MWA registration page at www(dot)myworldabroad/[your-school’s-domain-name]. Best wishes and good luck with promoting access to MyWorldAbroad at your fair!